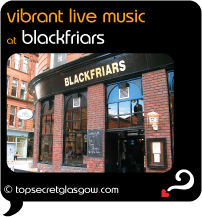 Blackfriars sits on a prime Merchant City spot. Popular with locals who like live music, it has become something of an institution in Glasgow. An active weekly events list keeps punters coming back for more. There are Club Nights featuring R'n'B, soul and 50s rock'n'roll. If you're up for learning to dance the tango, Wednesday is the evening for you. More than all of this, it bustles with energy as a bar serving great pub food until 8pm, and has an extensive range of drinks behind its welcoming bar. With so much happening, its little surprise this place remains a Merchant City star. Great news! Finding this page means you can now join our VIP list for Blackfriars. Grab your very own web page all about Blackfriars. Do you have a special story about Blackfriars? A funny experience? A grand occasion? A funky photo? A personal tip? A top secret?